Michael Bungay Stanier is a one off. A much travelled man he was born and raised in Australia, became a Rhodes Scholar at Oxford University and is now a resident of Toronto. I love his sense of fun and innovation, he’s the founder and senior partner of Box of Crayons where he is dedicated to helping organizations and individuals make the leap from good work to Great Work. This book is the follow-up to the wonderful “Find Your Great Work” and features contributions from Seth Godin, Dave & Wendy Ulrich, Chris Guillebeau and Leo Babuta. Michael was Canadian Coach of the year in 2006 and, in the great tradition of authentic coaches from Thomas Leonard onwards, The Box of Crayons website has a host of free stuff that will inform and entertain. 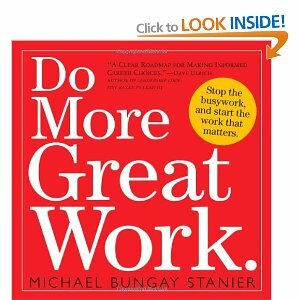 Do More Great Work, like its predecessor and his first book “Get Unstuck & Get Going“, is easy to read, it’s full of ideas, exercises, quotes and inspiration. It carries on the work of Stephen Covey who wanted us to differentiate between the urgent and the important in that it urges you to move away from the “busywork” and start the work that matters. It’s practical, small enough to carry around, with chapters that are concise and stimulating. An essential read for those who are looking to move from good to great. In addition there is a series of podcasts where you can listen to the interviews that Michael did with a host of field leaders whilst he was researching and writing the book and which he has continued to the present time. Entitled More Great Work it’s available via the podcast links on iTunes. I am fascinated by success and failure in sport. I love the small things that make a huge difference, the teams that are odds on favourites but come unstuck, the ability of an individual to turn their fortunes around. I have often wondered what would have happened had Gareth Edwards followed his athletics rather than his rugby career and whether his contemporary JPR Williams, having won as a junior at Wimbledon, could have succeeded at the higher level. Would their “God given” talent have transferred? What about the kid who could have been a great, say, lacrosse player but had no idea that the sport existed?Now that far fewer schools play cricket than in the past are there Bothams. Gowers and Boycotts who are having to make do with kicking a football and perhaps being OK club golfers? Is there a point in a sportsman’s career where the coach catches their ability and manages to both enthuse them, get top level performances and leave them with a set of values and habits that will carry them to the peak of their career? This book, subtitled How Champions are Made, by Matthew Syed goes a long way to exploring and explaining how success is attained and maintained. The surprise (or not) is that winners aren’t born, they are made; and the key to achieving greatness lies in hard work, and the right attitude and training. The author is a three-time Commonwealth table-tennis champion and an award-winning sports journalist. Through his own experience of being in the right place at the right time, he is able to give an autobiographical take on the subject. He and his brother were able to play daily as they had a large garage. His brother was as keen & talented as he was. The local coach was the best in the UK. The local club was the most successful in the UK. As a professional writer he brings an analytical mind to the subject. A thoroughly readable and fascinating book. Joanna Taylor and I are hosting a retreat for Dental Practice Managers in April this year. I’ll let Jo tell you more. With CQC and HTM 01-05 compliance threatening to overwhelm our desks and our minds, wouldn’t it be good to have an Outcome of our very own to look forward to? Imagine… two days in a beautiful 18th Century country house, set in fourteen acres of stunning gardens and woodland in rural North Yorkshire… here you can relax, unwind and learn some fascinating insights and new techniques, bringing you the skills and wisdom to help transform your personal and professional life. Joanna Taylor and Alun Rees bring a unique combination of skills and experience. Joanna is a Clinical Hypnotherapist and NLP Master Practitioner, and an INLPTA Certified Trainer. As the wife of a dental practice owner and a practice manager herself, she is very familiar with the joys and challenges of everyday practice. Dr Alun Rees BDS was the owner of the award winning Abbeymead Dental Practice in Gloucestershire and brings the experience of a quarter of a century of general dental practice. He is now a CTI trained coach and Kolbe Consultant, helping clients identify and overcome barriers to growth, achieve optimum performance and reach fulfillment both professionally and personally. This is an exclusive event, with only 20 places available so we can ensure individual attention – please make sure you book early. For Brochure and Booking Form go to the booking form via Jo’s website. 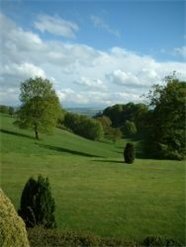 Members of BDPMA are entitled to a booking discount, plus an extra night’s stay at Wydale Hall on the Sunday at no extra cost – so you can be rested and refreshed for the start of the course!